But Alltel will give $25,000 to the one of those organizations that receives the most votes at alltel.com/community. Or Alltel customers can text PARK, FOOD, or HOME to 102102 to vote for the corresponding group. Voting is open through October 19. To learn more about Habitat for Humanity, or to hear from former Cornhusker Mike Rozier, who was in town to help promote this event, check out Lincast. If you’re the type who gets fired up over a good abortion debate, the UNL campus is the place to be. Better still, it sounds like there is a chance that folks from Westboro Baptist Church may be on campus today to enthusiastically share their message of love and compassion. Today might not be the day for school groups to take a field trip to campus. I’m skeptical, but it’s possible that the arrival of gas from Sam’s Club could lead to lower gas prices throughout Lincoln. Only Sam’s Club members would be able to purchase the gas. I have a hard time seeing the effects ripple much beyond the North 27th Street corridor. But hey, if my local stations at 48th and Highway 2 want to drop their prices because of pressure from 6 pumps at 27th and Superior, I’m certainly not going to complain. First, it looks like I owe the Journal Star an apology. 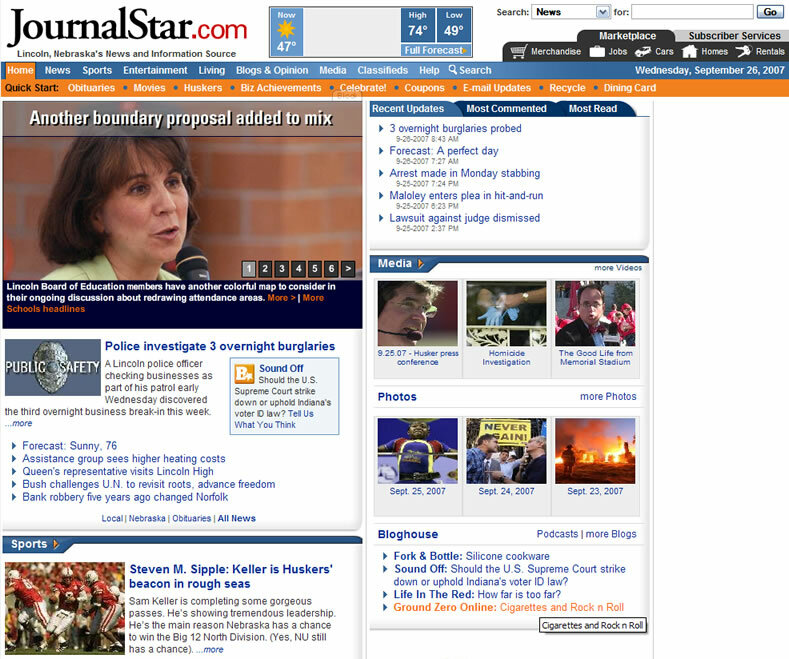 journalstar.com did cover Maria Moreno’s murder, but they offered their heavy coverage on Tuesday, not Wednesday (when it appeared in the print version). My jump to conclusions was based on incomplete and incorrect information. Many thanks to journalstar.com editor Steve Smith for setting me straight. Let me explain the main reason I was primed to jump to conclusions in the first place. I don’t think anybody is ever completely happy with how the media do their job. They leave X piece of information out, or they focus too much on Y, and so on. It’s a battle the media will never win. One of my media-related perceptions is what I consider an undue emphasis on the plight of “pretty white females” at the expense of persons from other demographics. Look up “Madeleine McCann” for one example in the national media. When I saw the front page of yesterday’s Journal Star, I knew without reading the article that the murder victim was probably not white and not rich. There was something about the way the article was presented and how it was written. Like the fact that the victim’s name didn’t come until the seventh paragraph. The article left me feeling uneasy about the quality of coverage the murder was receiving. Then I turned on the computer and went to journalstar.com to see if there were any updates on the story. There weren’t. Plus, as I wrote yesterday, I couldn’t even find the article at first. Like I said above, it turns out the story was apparently covered well online the day before. But I didn’t know that, so I got angry. Now, lest you think I’m accusing the Journal Star of active bias, I most certainly am not. Their overall record doesn’t support that charge. There may be a hundred reasons why Maria Rosario Moreno isn’t getting the coverage that some other victims have received. There could be a whole team of reporters out looking for more information for all I know. She may have been a loner with few friends and no local family; the LJS may not have nor have access to any photos of her; and so on. All that has been said about Maria so far is that ““She was a very nice woman ... And an unbelievably hard worker”, and “She was a pleasant little girl, as far as I’m concerned”. Perhaps that really is all the LJS can gather. Still, the story seems incomplete. Neither of the two articles so far mention Moreno’s family or any attempts to contact them. We don’t know her hometown, or the funeral plans. Without knowing anything about her life, most Lincolnites will quickly forget about her death. What I would like you to tell me is this: Am I reading too much into this? Should I just move on? Or is it fair of me to ask why Maria Rosario Moreno’s life hasn’t received at least a few more words on page 1B? Her name was Maria Rosario Moreno. Notice anything wrong with the Journal Star’s website today? Try the news page. Nothing? How ‘bout the local news page. Still nothing? Look waaaaay down at the bottom, under “More Local Headlines”. See it? That’s right: school boundaries, the Huskers’ woes, “The Office” parties, and gourmet salt all get front-and-center attention at JournalStar.com. Meanwhile, Maria Rosario Moreno was murdered, and the Journal Star buried her deep on the local news page. At least in the print edition the murder made the front page. Still, Maria’s name doesn’t come until the seventh paragraph. At least LJS readers know about designer salt. I am proud to announce the arrival of episode 1 of Lincast. Lincast is a podcast dedicated to covering topics related to Lincoln. Episodes will feature interviews, commentaries, debates, music, games, and whatever else seems like a good idea at the time. A conversation with Lincoln-Lancaster County Habitat for Humanity directory Marilyn Haley. Update: You may now subscribe to the feed in iTunes using this URL: http://lincolnite.com/lincast/lincast.rss. Lincast will eventually show up in the iTunes store. Until then, you can subscribe manually by going to Advanced -> Subscribe to Podcast. I would love to receive your comments, questions, contributions, suggestions, and so on. Please leave a note in the comments or use the e-mail address mentioned in the show. Step 1: Create a giant blight zone to allow TIF. Public employees + public equipment = private funds? I don’t think so. That’s why I agree with Attorney General Jon Bruning’s opinion that the Nebraska Historical Society’s “private” account must be made public. I wonder how often that sort of thing happens in government. I’m going to guess: Often. A cowardly lion, that is. South Lincoln is sending a clear message. If alcoholic women and Alzheimer’s patients are threatening to the sacred soil of South Lincoln, then how much more the fight will be over anyone else. I wouldn’t give stray kittens much hope. [Man ] Where’d you get your body from? Tell me where’d you get your body from? [Woman] I got it from my mama. I’m glad to see Top 40’s rigorous quality standards are still being upheld. Anyway, just a couple days into my listening experiment, KFRX went AWOL. Apparently the format has moved to 106.3, “Lincoln’s Hit Music”. (Such a delightfully generic tagline, don’t you think? It goes well with the music they play.) And KFRX? It will become adult contemporary. Why the format flip-flop after literally decades of Top 40 at 102.7? Who knows. I will never understand the radio industry. If you don’t want to see a new arena in the Haymarket, or if you’re staunchly against the hundreds of acres Lincoln keeps tagging as blighted, you’d better say your piece soon. There’s a public hearing today at 5:30pm—and probably a City Council vote—to determine if 403 acres between Salt Creek and the Haymarket should be declared blighted. The reality of the situation is that the area will be blighted. If Lincoln wants a new arena—it does—we have to put it somewhere. Considering the absence of proposals to put it elsewhere—or at least the absence of proposals with any serious backing—the Haymarket is effectively our only choice. And by most measures, it’s our best choice anyway. There is still one very serious sticking point: the cost of an arena. How will Lincolnites respond to funding through TIF, plus, in all likelihood, additional tax-based funding mechanisms? Several members of the City Council appear to be entertaining the notion of letting Lincolnites vote on the arena at some point, so we may find out soon enough. But that’s putting the cart before the horse. First we need land. If you have strong feelings about those 403 acres, go say your piece tonight. Agree or disagree: The Blackshirts couldn’t stop Stephen Hawking—without his wheelchair—in a game of red rover. Discuss. Living a stone’s throw from El Chaparro on 13th and F (the only place in Lincoln I have found that has a California burrito on its menu), I am pretty well set-up to eat great Mexican 7 days of the week if I wanted to. But I am also happy to say that the King Taco near Robber’s Cave is a nice addition to the near, near south area. As Mr. Wilson pointed out in a description of his earlier visit, King Taco will be appealing to some Lincolnites and unappealing to others. This is, in my opinion, a good thing: An indication that the number of Mexican eateries in town have increased to the point where we can pick and choose from a wide variety to fit our tastes and wallet sizes. As King Taco is right on the way to my gym, I stop there frequently. Its cheap, fast food, and the staff there are usually pretty friendly (to make up for the bare atmosphere). I won’t dwell into the hits and misses, and like all restaurants there are both at King Taco, but instead I want to encourage you all to give their hard, crunchy tacos a try if you haven’t already. In my opinion, hard shell tacos are the staple of any Americanized Mexican joint nowadays. As ubiquitous as they are basic, making a hard shell taco good can be very difficult since - like a burger, slice of pizza, or eggroll - everyone has their own opinion and expectation of what a good one is. I think that the hard shell tacos at King Taco may be the best this city has to offer. Unlike the overly salted and seasoned taco meat you get at Taco Hell or Taco John’s, at King Taco the meat there is relatively unseasoned, but this is made up for the fact that their salsa is pretty good. They also use a fair bit of white queso as opposed to only the yellow/cheddar cheese you usually find at other places. Plus, they come with a dab of cool sour cream too, which is a nice touch. The corn shells are really great too, a bit thicker, fresher, and crunchier than in a number of other places. Finally, these suckers are only .79 each, or .59 on Wednesdays and Saturdays. I recently rolled through a bunch of these delicious treats, leaving a heap of greasy wrappers, lettuce strands, and crumpled napkins in my wake. Give this place a try people - it could use some business! In other hard shell taco related news, the Downtown Taco Bueno opened late this week, adding more variety to the city’s Industrialized/Americanized Mexican food chains. Their hard shells are OK, not a whole lot different from those at Amigos, and like Amigos it also has a little salsa bar. However, their salsa tasted a bit on the sweet side to me. I know some people like sweet salsa, but I am not one of them, so I don’t know how often I will be patronizing Taco Bueno. Otherwise, its a fine place for Industrialized/Americanized Mexican. However, on those days when I am in the mood for some Industrialized/Americanized Mexican food, I’ll probably hit the Taco John’s on south street. Sometimes it seems like LIBA—the Lincoln Independent Business Association—complains a lot. “We don’t like this tax,” “Scrap this program,” and so on. Whether or not it’s true that they respectfully disagree more than the average bear, today LIBA executive directory Coby Mach is in a good mood and has some good words for Mayor Beutler. He even ends his piece with an exclamation point!